Our Economic Meter tags are made of quality white self-adhesive vinyl. The decals have slit backs for easy peel and stick. The image is printed using screen process printing sometimes called "silk screen", which is MUCH higher quality and LONGER LIFE than other printing processes. Decals are 2.5" x 1.25". 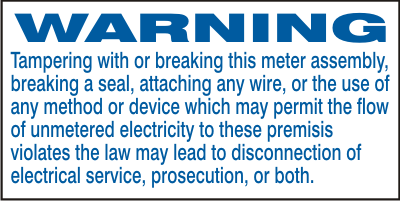 Decals are made with either REMOVABLE ADHESIVE, which means you can remove the decal without leaving a glue residue OR decals are made with PERMANENT, DOUBLE GLUE ADHESIVE which sticks best to old meters which have oxidated, rough and rusted surfaces. DECALS ARE MADE WITH YOUR MESSAGE, YOUR LOGO AND YOUR CHOICE OF COLOR IMAGE AT NO EXTRA CHARGE. Price is 12 cents per decal when you purchase 25,000 decals, 14 cents per decal when you purchase 20,000 decals, 16 cents per decal when you purchase 15,000 decals,18 cents per decal when you purchase 10,000 decals, 20 cents per decal when you purchase 5,000 decals, and 30 cents per decal when you buy 1000 decals.